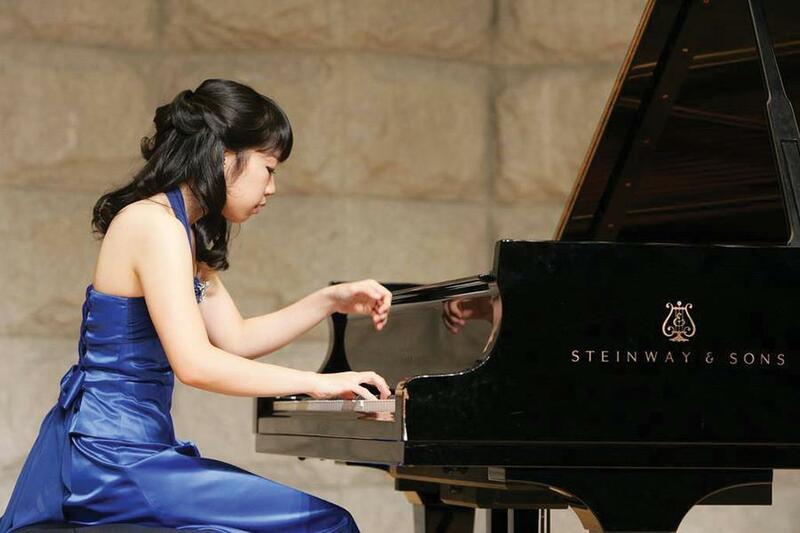 Bienen graduate student Hyejin Joo performs her senior recital in Korea. After winning the Northwestern Concerto/Aria Competition in April, Joo will perform a solo of Chopin’s Concerto No. 1 with the NU Symphony Orchestra. On a typical day, Hyejin Joo sits at a piano in a small Bienen practice room for about five hours, perfecting her performance of Frederic Chopin’s Concerto No. 1 in E minor. Joo, a Bienen doctoral student, was selected to perform with the Northwestern University Symphony Orchestra this weekend after winning the Northwestern Concerto/Aria Competition last spring. Joo will perform the Chopin concerto — which she played at the competition — at the Symphony Orchestra’s performance. This is her first time performing with an orchestra. She originally chose to perform Chopin’s concerto for the competition because it was a piece she heard and wanted to play since she was in elementary school, Joo said. She first heard the second part of the concerto in a TV series, and was struck by its lyrical quality, she added. Joo said she loved the piece even more after listening to the entire 30 to 40 minutes. The concerto comes in three movements; the first movement is fast and majestic, followed by a sorrowful second movement and completed with a third movement in syncopated rhythms. Joo tries to capture the different musical styles throughout her performance, she said. Joo learned the notes of the piece years ago, but said she really started practicing it deeply four months before the competition. “It’s a difficult piece for the pianist and requires an elegant sensitivity and technical athleticism and she does this all beautifully,” said Bienen Prof. Alan Chow, Joo’s piano teacher. Chow works with Joo to help her vision come alive and bring out the positives that he hears in her music, he said. Joo has been working on putting both her feelings and Chopin’s feelings into the piece, she said. Similarly, Director of Orchestral Programs Victor Yampolsky, who will conduct Joo’s performance with NUSO, said he hopes to bring Chopin’s rich persona to the stage. “Every time I go onstage accompanying this particular concerto I’m touching the soul of a human genius, which is a very thrilling moment in life,” he said. More than 50 string players and more than 20 wind and brass players will perform the concerto with Joo. She said being accompanied by all of these additional musicians will make this performance of the concerto more difficult than she is used to. Chow said Joo’s performance with NUSO is a huge opportunity and will most likely be one of the highlights of her time at NU. He said he admires the artistry and maturity that come out in her playing, the product of 20 years of practice and performance. Yampolsky said he also admires Joo’s ability to interpret Chopin’s elegant melodies and harmonies in the concerto. Aside from Joo’s solo, NUSO will also perform Stanislaw Moniuszko’s Fairy Tale and Antonin Dvorak’s Symphony No. 7 in D minor, two pieces that complement Chopin’s concerto and make for a thematic homogeneous performance, Yampolsky said. The concert will take place Saturday at Pick-Staiger Concert Hall.